Recently we had the great fortune to stay at the Great Wolf Lodge (a publicly traded company and the nation's largest family of waterparks) in the Wisconsin Dells. 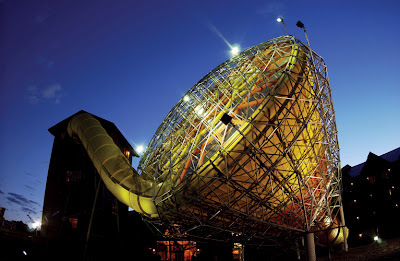 The Wisconsin Dells is known as the WaterPark Capital of the World, and we were delighted to explore. WHAT FUN! Our family loved our visit there, and plan to head back as soon as we can. Where to begin? From the moment you walk into the Great Wolf Lodge foyer, you embark on an experience like no other. The Lodge is a four-story log-sided resort. Rustic lodge decor welcomes you in, with an extraordinary three-story rock fireplace, an animated clock tower, welcoming staff, and more. The Great Wolf Lodge has over 100,000 square feet of waterpark, including a large indoor waterpark (three cavernous rooms!) and an outdoor waterpark. 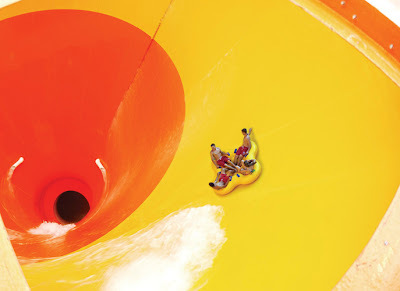 One thing (among many) that makes Great Wolf Lodge different from other waterparks is that their waterpark is exclusively for guests of Great Wolf Lodge. Many waterparks sell day passes or wristbands to their parks, while the only people in the waterpark at Great Wolf Lodge are guests. This was heavenly - often at other waterparks, we've had hordes of older teenagers run around, having a blast but often at the expense of younger children being run over. Great Wolf Lodge is environmentally aware, as well. From the waste and recycling containers all around, I could see that they are committed to being green. I was not surprised, therefore, to find out that Great Wolf Lodge resorts are the first and only national hotel chain to earn the distintion of Green Seal Certification. Green Seal is a 20-year-old, independent, non-profit organization dedicated to creating a more sustainable world. Green Seal created a rigorous, science-based environmental standard for the industry, which includes nearly three dozen environmentally responsible criteria for lodging properties. Great Wolf Lodge also has their own, even more sweeping, environmental program called “Project Green Wolf.” Both the hotel and waterpark portions of the business are part of Project Green Wolf, and the program also includes an inventive educational program for the resorts’ youngest guests created in partnership with National Geographic Kids™. Project Green Wolf includes management of fresh water resources, waste minimization, recycling, and reuse, energy efficiency, environmentally and socially sensitive purchasing, guest education, and more. I was impressed with the ecological management of such a large resort, and even more so once I learned of these Green Seal and Project Green Wolf measures! We've shared their Project Green Wolf here. Our 6-year old daughter was anxious to get into the waterpark and start playing, so we quickly changed and headed there. WHAT a surprise! After exiting the elevators, there was an arcade (ubiquitous at waterparks) and the waterpark entrance. Once inside, there was a very large set of wooden racks with lifejackets on them, if any guest needed them. Many of the small children we saw had availed themselves of this free service. Inside the waterpark, it was a very comfortable 84 degrees. There were three cavernous adjoining rooms, each with their own special waterpark features! Overall, there are 17 waterslides, six pools, 2 hot tubs (one for adults only, and one for families), Fort Mackenzie - a four-story interactive treehouse waterfort (with a 1,000 gallon tipping water bucket! ), the Howlin' Tornado (a six-story extreme tube ride with 65-foot funnel drops 30 feet every second, a basketball hoops pool with a really cool floating beaver that our daughter LOVED climbing on, all sorts of kids rides (slides, rope course, lazy river), a wavepool with a lovely and scenic boathouse theme, many play areas for very small children, and more. The lifeguards were very attentive and always moving. As it was spring (and cold out), the Outdoor WaterPark was closed. There are also many other services available at Great Wolf Lodge - a fitness center, Elements Aveda salon (smelled great! ), a kids salon called Scooops, the Cub Club (daily crafts, activities, and bedtime storytelling), and more. Several times a day, the animated clock tower comes to life and tells a beautiful story about nature, teaching kids to respect and care for nature. Our daughter loved it! There is also a singing moose head (singing our favorite, Sinatra) near the guest services desk. There are a variety of guest hotel rooms at Great Wolf Lodge, as big as your family needs.You can also stay in one of the condos at Great Wolf Lodge. There are various types and sizes of condos (Lone Wolf Condo, Black Bear Condo, Wolf Pack Loft Condo, Timber Wolf Condo and Great Frontier Loft Condo). When I toured the condos, I was quite impressed with the living arrangements - a full-size kitchen, great dining room, living room, separate bedrooms, and more. This would be a fantastic option for families (or family friends) traveling together. You could really save a lot of money using this option. 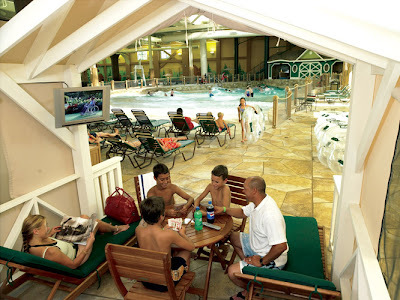 Great Wolf Lodge has several restaurants on site, as well as a gift shop. I was amazed to find that Chef Paul uses as much local and organic produce as he can (even buying basil from a local farmer with the roots - and dirt - still on it!). I also appreciate that when I asked so many employees if they enjoyed working there, they all said Yes. That is rare! It truly seemed like a family of employees, which helps visiting families feel a part of the Great Wolf Lodge Tradition. Yes, Tradition - I get a feeling that so many families make a tradition out of heading to a Great Wolf Lodge again and again! They have an upcoming 4th of July celebration (with fireworks!) coming up, which will also celebrate their new Magiquest activity center for kids. One thing that I noticed that was different about Great Wolf Lodge is the extreme attention paid to making the resort run smoothly - from the constantly-moving lifeguards, to the abundance of luggage carts, to wide areas for people (and wheelchairs) to move through, to a variety of meeting areas for businesses/groups. We needed an accessible room, and I was impressed with the wide doorways, accessible bathroom, and more. As well, within the waterpark, no area is inaccessible - I could get everywhere on my wheelchair scooter, so I was able to watch our daughter play all of her favorite activities! Well - as you can tell, we Just LOVED our stay at Great Wolf Lodge. I highly recommend them for a fun family outing!